Well, I'm getting close to ordering a truck - will likely be an 05 supercrew 4x4 lariat, or possibly a king ranch (going to have a look at one this weekend). I've looked at the Chevys and Dodges and all in all the F150 looks like it will win out. Anyway, I'm still humming an hawing about the lease or purchase issue, as well as a few option choices. It seems to me that the biggest option consideration (i.e. one or the other) is the sun roof / DVD decision. From a purely value oriented standpoint, which do you think is the better option to have? Which would you more like to purchase if you were looking at buying one of these F150's used in three years? Thanks for comments. Hopefully I'll join the club soon! Consider how much use you will get out of an option before you make your decision. Here in So Cal, I make use of the sunroof option quite often. Get the sunroof! I wish I had! Then get the dvd system with the headrest monitors. sun roof, you can allways add a dvd player, either indash or headrest or travel style that sis on the console. I say go for the sunroof. You can always install an aftermarket high quality (better than factory) DVD/TV system later. another sunroof vote, you can't add a factory quality sun/moonroof after, dvd you can, where ever and however many of them you want. Check out the lightforce lights if your gonna add lights, we use them on many of our trucks at work that see the worst of offroad conditions. They are bulletproof (literally) and they look good. Um thats easy question to answer.....SUNROOF all the way. After market DVD systems are cheaper and better than factory ones! Good luck trying to get an aftermarket sunroof better than the factory one for less money. Go with the sunroof and add headrest monitors...check out my gallery to see how I set my DVD system up. I opted not to get the sunroof because I rarely use them and it drops the headliner a bit. If youre tall and need the headroom, get it without the subroof..it adds alot of space. Otherwise, if you think you'll get use out of it, go for it as it is a big piece of glass and opens nice and wide. I totally agree with jhogan. If you have no kids, pretty much no need for the DVD player. Good luck with your decision! I had a choice between a king ranch and my lariat and I picked the lariat because it had the moonroof and the power rear window. The factory DVD system is not that great considering what is on the market today. Although, I won't say its a bad system because it is decent. You must be a freakin GIANT to need so much headroom you would pick a truck with-out the moonroof. I am 6'2" and could still get in with a 10 gallon hat in my truck with the moonroof. 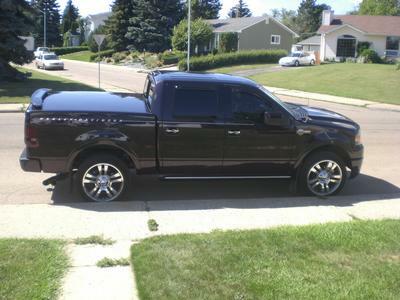 I just ordered a '05 F-150 King Ranch. One of the reasons I went that route was because I did want neither the sunroof nor the DVD. The sunroof is one of those good ideas but does not seem all that practical. I will roll down the window if I need some air. I have been in a lot of cars that had a sunroof but they rarely get used. The DVD is a real blessing if you have kids but that is off in the future for me. Neither of those options is going to make your truck appreciate in value. The point is you will spend more money now on the options than you will ever get back. Don't look at it as an investment decision because it is a bad investment. If you would like to have a sunroof, then by all means get one. Same goes for the DVD. It would be a bad financial decision to get either based on return on investment. Last edited by tmuenster; 03-04-2005 at 08:20 AM.